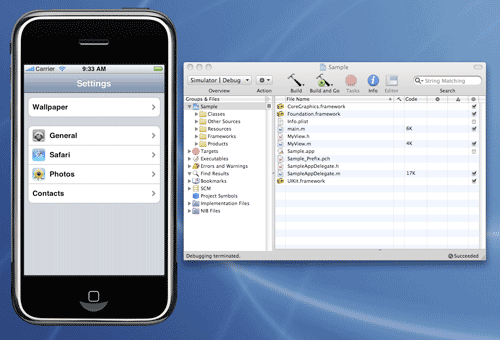 iOS Apps, Running On A Mac? Has anyone created an emulator program for the Mac to run iOS applications on OSX? I realize that they might seem underpowered, but the sheer size of the program library combined with the interoperability of the programs and documents created with them (like Apple is trying with the iWorks suite) seems very worthwhile to me. Re: iOS Apps, Running On A Mac? Yes, you can do this with the iPhone emulator that's part of XCode. It's quite likely, however, that you can only run apps that you have the package files or source code for -- I haven't played with the emulator lately, but IIRC you can't access the App Store or download apps with it. But I was really thinking of a full emulator. For users. Not just for programmers. Would this violate Apples Developer's License? Would this violate Apples Developer's License? Likely not only that, but also the EULA for iOS itself. I suspect from Apple's view it would be akin to building a Hackintosh. "...akin to building a Hacintosh." Yeah, I guess I get that idea. I wonder if I can get Apple to bite on this suggestion and create this program themselves? Thank you for posting the picture. It's interesting to me that more homebrew programmers have jumped back into the mix with the advent of iOS. I realize that it's a completely different situation, but it is reminiscent of the Apple ][ days, at least conceptually. It's been making me think about picking up C++ again. It's only an iPhone simulator though, it runs x86 code with the iPhone UI. Thus, any iPhone applications you don't have the source for won't work, as they'll have ARM binaries instead. But, as stated before, you can recompile for it if you've got the sources.